I bought one 1/4 inch jack from a store near my house and connected my piano to the audio interface, and when I listened to that recording, there was a lot of noise, which I think came from the cable, as it was also when I did not play a note, and also, my equipment is certainly decent. I used it later with an electric guitar cable that I had which is also more expensive, and it was a little better but still, if I turned the input volume on the audio interface a little over the half, it would start making noise, and if I didn't, the recording would just be too quiet. My question is, should I buy more expensive pl cables? Most expensive cables are designed by description to guitars, so I'm not sure if I would waste my money..
Would be glad for advices how to solve my problem. PS. I know that it would be better to use 2 pl cables instead of one, but I'm not sure if that has to do with the noise problem. Use the [L/L+R] Aux Out jack on the back of your piano into the L input of the Roland quad-capture. 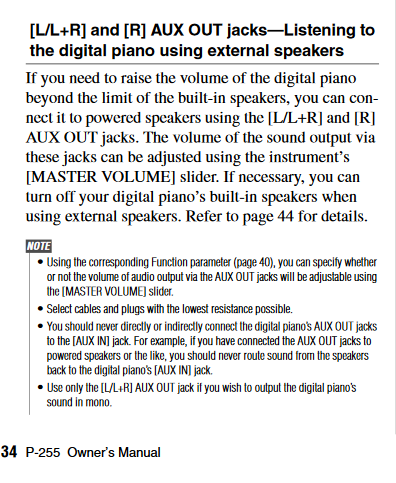 Keep the volume slider of the piano well up, or if this is annoyingly loud in the piano's speakers try bypassing the volume slider, as detailed in the Yamaha manual excerpt below. This will send a robust signal level to the Roland. Don't be frightened of having the input level controls on the Roland low. Low for a Line input, high for a Mic input is fine. You will get a better recording by using two cables. But it will be better in terms of stereo effect, not signal quality. Not the answer you're looking for? Browse other questions tagged piano recording digital-piano homerecording cable or ask your own question. How to connect bass to windows box and record the session? How to reduce noise when recording audio to computer from keyboard?